Raheem Sterling scores the third goal of the night. 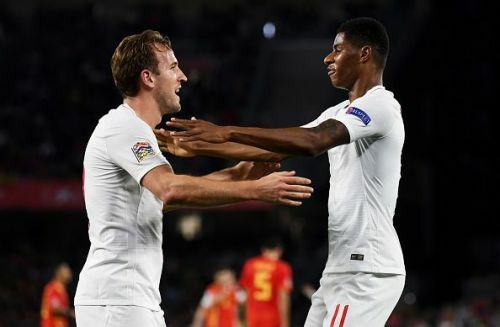 Seville witnessed an incredible clash between Spain and England on 16th October 2018 in the Round 4 of UEFA Nations League - Group 4. England required no less than 3 points to qualify for the semis. A scintillating first-half display earned them an unexpected victory. The Spanish gave it all to gain something out of the game in the second half. Ultimately they fell a goal short. A controversial decision of not awarding Spain a penalty became the topic of conversation. Raheem Sterling celebrates after scoring the opener. Spain started intensely and they could have had a dream start when a deflected shot from Thiago Alcantara went the wrong side of the post. Marcos Alonso came close from the resulting corner. 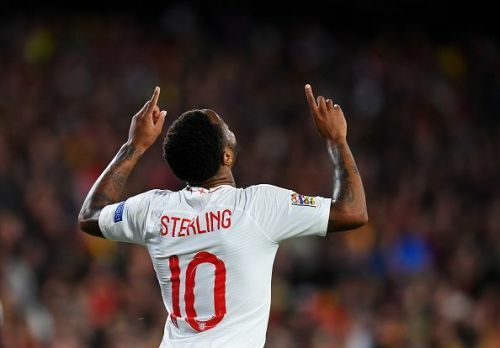 Somehow England managed to withstand the early storm and with only 16 minutes on the clock, Raheem Sterling earned the visitors a shock lead. Harry Kane was instrumental in England's win over Spain. Harry Kane was the focal point in all three goals. The centre-back pairing of Ramos and Nacho found the Spurs striker too hot to handle. The first two goals involved Pickford picking out Kane brilliantly, bypassing the hosts' midfield. 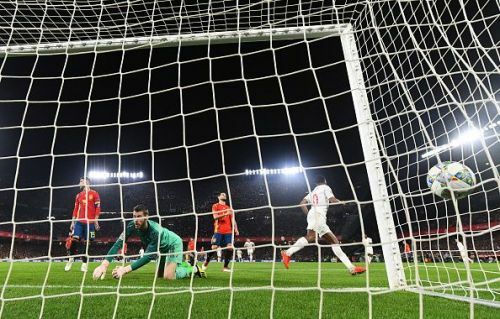 David De Gea was left rooted to the spot for the opener as Sterling found the top corner. The holding play by Kane for the second goal was a sight to behold. A perfectly weighted pass to Rashford meant he couldn't miss at all. De Gea could only watch his side go two goals down. A flawless first-half display from England was rounded off in the 38th minute when Ross Barkley spotted a beautiful run from Kane, with Sterling left only to tap the ball in. Spain dominated the ball owning 70% of possession in the first half but hardly threatened to break the English defence. The game is never over at half-time, not when the opponents are Spanish. A double substitution by Luis Enrique in the 57th minute sparked a comeback and Seville was dreaming again. After all, they had witnessed Liverpool throw away an identical lead last year. Super-sub Francisco Alcacer headed home from a corner in the 57th minute to give the hosts some hope. The hot streak of the Dortmund striker continued as he has 10 goals to his credit in 6 matches. Francisco Alcacer continued his excellent form. Daniel Ceballos was running the show in the second half as England had to sit deep within their own half. Southgate's men could not find the rhythm they had in the first half as England struggled to keep the ball. A horrendous error by Pickford nearly cost the Three Lions a second goal. Polish referee, Szymon Marciniak, failed to spot a pull-back from Pickford on Rodrigo, which should have led to the Evertonian sent off and a penalty. Enrique's men had to settle for a corner. Jordan Pickford made a dreadful error. Alonso rattled the crossbar in injury time and Ramos headed his side to only one goal deficit soon after. England had to wait 31 years to taste victory on Spanish soil. A victory no-one could have foreseen.